“The hypocrite men and hypocrite women are of one another. 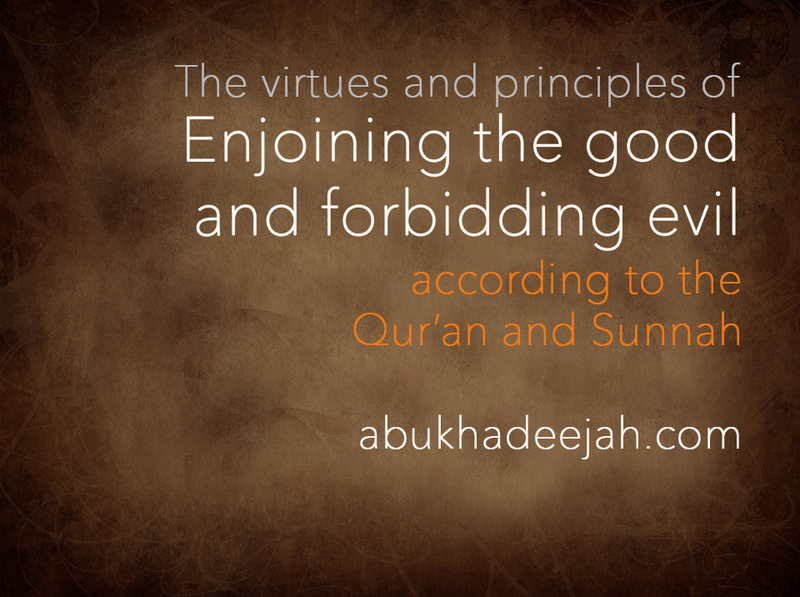 They enjoin what is wrong and forbid what is right and they close their hands. They have forgotten Allah, so He has forgotten them [accordingly]. Indeed, the hypocrites – it is they who are the defiantly disobedient.” They “close their hands” from giving in charity in Allah’s cause. They do not stretch out their hands to give in charity or in offering to do good because they do not believe and because wealth is more beloved to them than everything else. The believing man and women are different – they establish the Prayer, they pay the Zakāh, they obey Allah and His Messenger alongside enjoining the good and forbidding the evil. This is for the purpose of establishing the Religion purifying society from corruption. “O, my son! Perform the Prayers, enjoin the what is good, and forbid from all that is evil and wrong, and bear with patience whatever befalls you. Verily! These are some of the important commandments ordered by Allah with no exemption.” (Luqmān 17) This verse is just like the previous verse in Sūrah Al-Asr that a person is to enjoin what is good and forbid what is wrong, and he must remain patient if he receives harm in that path. That is because he is acting in the cause of Allah so whatever harm befalls him there is a reward for him with Allah, who is the Most Perfect, free from all imperfections, the Most High. “O you who believe, protect yourselves and your families from a Fire whose fuel is people and stones, over which are [appointed] angels, harsh and severe; they do not disobey Allah in what He commands them but do what they are commanded.” (At-Tahreem 6) So you are in charge of your household and accountable. However, if you cannot enjoin and prevent with the hand, and you have no authority, neither general (over a nation) nor specific (over a household), then you should forbid what is wrong with the tongue by clarifying that a certain action is forbidden and is sinful or impermissible. You can explain by admonition, or by a khutbah, in a class or with a private word of advice between you and your fellow brother – explain the matter to him. If your advice to him bears no fruit, you may tell another person. You may convey what he does to one who is able to prevent his evil with the hand. So you may tell law-enforcement (police) or those in charge of enjoining good and forbidding wrong, you may tell the ruler – all of this comes under the banner of forbidding the evil with the tongue, i.e. with speech. If one is not able to forbid evil with speech, such that you are prevented from that, then you forbid it with your heart, not accept it at any time and you abandon the gathering of evil and you distance yourself from the people of evil. Do not sit with them so that you protect yourself. So the meaning of the verse is: If you have enjoined the good and you have forbidden the evil yet your words are not heeded, then be concerned with yourself. Do not say: ‘I am like the people’ or ‘this is upon the people themselves.’ Rather you should enjoin the good and forbid the evil, and if your words are not accepted then do not concede anything from your Religion such that you flatter the people and just go along with them. Al-Barbahāri also said: “…except when you fear a person’s sword or staff.” If you fear that when you forbid evil you shall be killed, or beaten then you are to move to the next stage and that is to explain with speech. And if you fear the same if you were to speak, then move to the third stage – and there is no one who can prevent you from that. No one can prevent from rejecting something with one’s heart because no one knows what is in the hearts except Allah, the Most Perfect, free from all imperfections, the Most High.